I have to let you in on a little secret… I am OBSESSED with nachos. There is just something about the salty crunchy chip covered in rich warm melted cheese that is the ultimate comfort food for me. Any good nacho connoisseur has a special place in their heart for RO*TEL. You have seen me use it in quite a few recipes on my site, so a big THANK YOU to RO*TEL and ConAgra foods for sponsoring this post so I can bring you my newest (and cheesiest) chicken bake recipe. I have so many memories of family gatherings growing up. The counters were always packed with dishes everyone brought and there always was a huge variety. The one staple that had to the there though was the RO*TEL cheese dip. It was a given. If we gathered it was there. It is one of those foods that kind of defined those moments…. and maybe where the nacho obsession began. I will admit that I eat nachos far more than I probably should. I do try to pack them full of healthy extras to justify it, like corn, black beans, avocado, fresh cilantro, and tomatoes. Doesn’t that sounds delicious? So why stop there? I mean the nachos are good because of all the stuff topping them, so why not take all that good stuff and bake it with some tender, juicy chicken breast? BINGO! 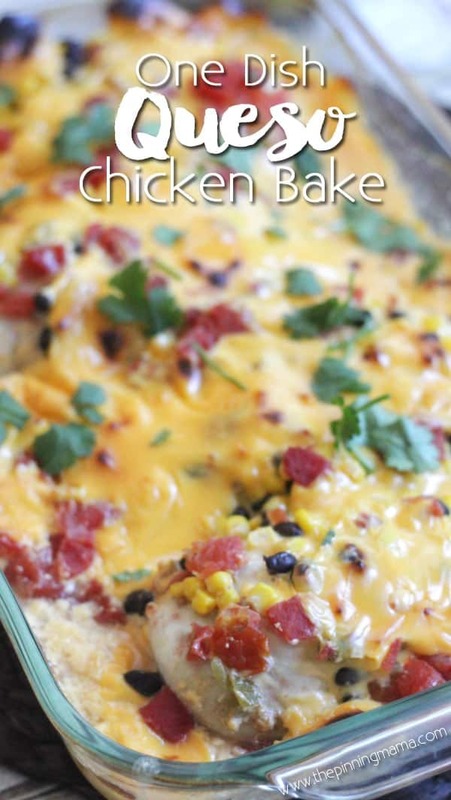 The Queso Chicken Bake was born! The reason I love to make chicken bakes so much is that life is BUSY! It is hard to balance it all, and when you have to spend a ton of time in the kitchen daily to make and and then clean up a hot fresh dinner, there is not much time left for family time. If we can make and clean up dinner fast, then we get to do some of our favorite things together like going on walks around the neighborhood in the summer, and snuggling up and watching our favorite TV shows together in the winter. If you need more super simple, super delicious easy dinner recipes, check out my other Easy Chicken Bake Recipes here! Reader favorites include: Italian Chicken Bake, Fajita Chicken Bake and the Bacon Ranch Chicken Bake. Give them a try! But back to the food. This recipe is so fantastic because as I mentioned above it is easy so it gives us more time with the fam. Also, it’s queso! 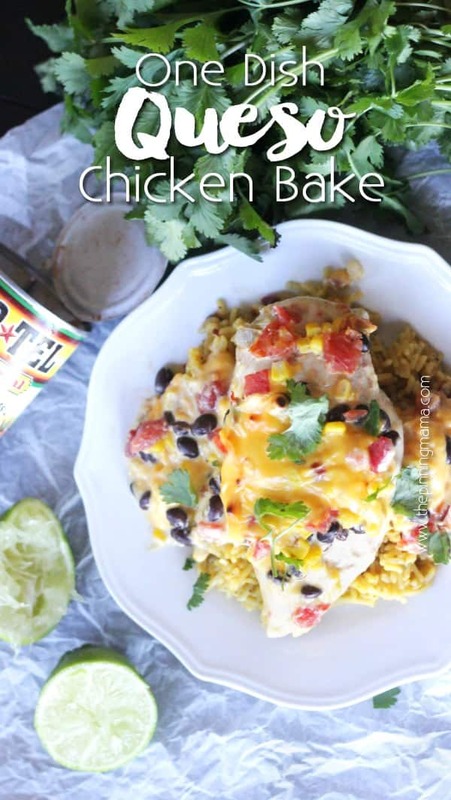 I mean let’s be honest, I have 3 small kids, so I go through my fair share of dinnertime battles, but when you are serving queso (packed with wholesome chicken, black beans, tomatoes and corn) the kids gobble it up. Heck! I gobble it up! To make this dish you need 5 ingredients. That is it. Start with a large baking dish. I used a 9×13 glass dish for 4 chicken breasts. Place your chicken flat on the dish. If the chicken breasts are especially thick, you may want to butterfly them (cut in half) to reduce the cooking time. Open drain and rinse the beans, and open and drain the corn. You will use the full can of RO*TEL. Pour the corn, beans and RO*TEL over the chicken breasts. I use canned corn, because that is what we usually keep on hand, but you could use frozen corn as well, as long as you thaw it. Next cut the block of Velveeta into small cubes, around 1/2 inch. No need to be exact, but it makes it cover the dish a bit more evenly. I bought a 32 oz block and used half. If you want extra cheese you can use a little bit more. Then spread over the top of the chicken and veggies. Cover the dish with foil and put it into an oven preheated to 375˚F and bake for 45-55 minutes or until the chicken is done and the juices run clear. If you like the cheese to be a little crispy on top, remove the foil the last 5 minutes of the cook time. Either way, it is just oooooooey, gooooooey, cheesy goodness topping the delicious chicken and wholesome veggies ready to fill your family up right. When you take this out of the oven, the cheese will be melted, but the juices from the chicken and all of the veggies will be “watery” at the bottom of the pan. I removed my chicken breasts, then mixed this delicious mixture of chicken broth, RO*TEL, and veggies together with a fork to make the creamiest best queso sauce then spooned the extra sauce on top of the chicken and rice when I served it. A fork or whisk works well to get the cheese to combine into the juices smoothly. I served this with some Spanish rice I picked up, but you could also serve it with chips, tortillas or even a salad. It is a great way to have a warm comforting meal to the table quick. Thanks again to ConAgra for sponsoring this post and the Mom It Forward Network for the opportunity. 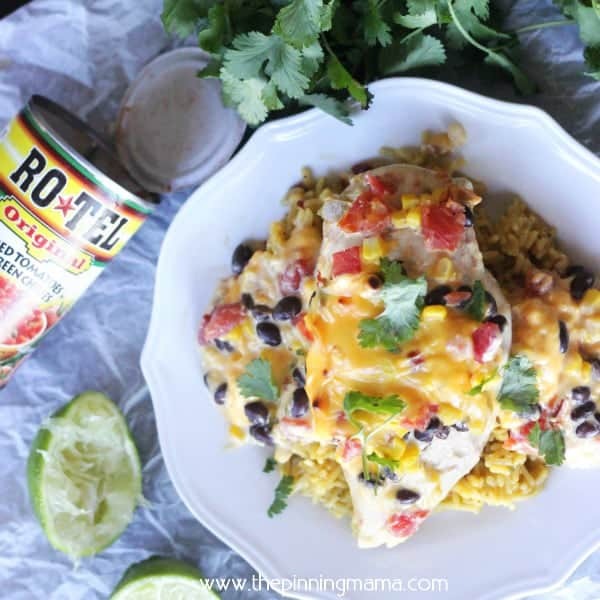 You can find more recipes with RO*TEL and other ConAgra foods on their Facebook, Instagram, Pinterest, and Twitter. 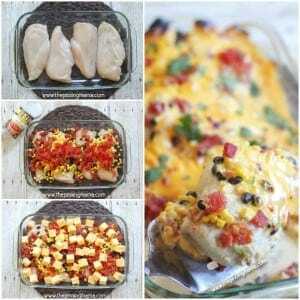 Place the chicken breast in a baking dish flat. Butterfly breasts if they are especially thick. Layer the corn, black beans, and RO*TEL on top of the chicken. Dice the queso cheese into 1/2 inch cubes and spread them evenly over the top of the dish. Cover the dish with foil and bake in a preheated oven at 375F for 45-55 minutes or until the chicken is done and the juices run clear. *if you want the cheese to be a little crispy remove the foil for the last 5 minutes of baking. Remove from oven then remove the chicken breasts from the pan and use a fork or whisk to work the extra cheese into the juices to form more queso sauce. Perfect! This is exactly the kind of dinner that my boys love to eat (and that I love to cook)! Easy is BEST! And your photos are lovely! Thank you Blair! You are a joy as always to see in my comments. Hope your family enjoys it! I did not drain it in mine. When I served it I kind of mixed the cheese that melted down into the liquid from the chicken and veggies and it made a super creamy cheesy dip we just spooned over the top of everything. I will go back in the post and add a note about that just in case others wonder too. Thanks so much for the comment. Adding this to my must-try soon list! It looks amazing! I did make this again and this time sliced the chicken and cooked it before adding to the bottom of the dish. I also used 1/2 velveeta and 1/2 cream cheese cut into cubes. The cream cheese made it creamy after stirring it up. It was very good. I bet the cream cheese was amazing! Did the cheese not have the curdled look the second time you made it? I think I want to try with the cream cheese… if the chicken was already cooked how long did you leave it in the oven? Omg I made this tonight and it was fantastic. I subbed red bell pepper in for black beans and it was awesome. Thank you for sharing this amazing meal. My family really enjoyed the dish. It had a lot of flavor. I did season my chicken, and we omitted the corn. Used mild cheddar cheese. Unfortunately, it came out very liquidy. Trying to stir the cheddar with the juices resulted in an even bigger mess. After seeing the results of that, I stopped and just served it over spinach. The heat wilted the spinach and created a wonderful meal taste wise. I believe this dish would have more success in the skillet or crock pot, with the cheese added last. I appreciate this recipe however, and want to thank you for giving me a new meal idea. If you changed the recipe, you did not make this recipe. How can you give this recipe only three stars when you have not made this recipe? Pet peeve of mine…. changing out ingredients and then expecting to get the same results. So unfair. Did you use Velveeta cheese or any type of cheddar cheese? I used Velveeta cheese! Cheddar won’t mix well at the end so I definitely recommend velveeta! ConAgra foods are toxic genetically modified organisms and your recipe call for too many cans full of BPA poison. Thanks for the recipe tho. I’ll try it with pastured chicken breasts and organic raw cheese and fresh corn tomatoes and green chilies. I would not ever buy anything from that toxic company. Jeez someone is on their high horse. You know you can get almost anything in a can with a BPA free liner, right? Enjoy your dinner. I bet it makes your poop the shinniest cleanest poop in all the land! Shawna, we must be long-lost sisters! Loved your comment! I seasoned the chicken breasts with chili powder and ground cumin. I drained the Rotel and used 8 oz Velveeta cheese (I ran out). I used unthawed frozen corn. I served it over Knorr Rice Side’s White Cheddar Queso. Still a little watery, so I drained it. Definitely needs at least 16 oz Velveeta. Needed more flavor, so next time I will rub the chicken in seasoning instead of sprinkling it on top. Will also serve with tortilla chips next time – needed something crunchy. No sadder flavor than unseasoned meats! Do you ever season your food? Based on the images of the other massive amounts of unseasoned naked chicken peeking out of these recipes I’m assuming you don’t really let a spice rub tenderize and flavor your base befor you all these combinations on top of them. Cheese and sauce alone can’t fix this. Feel free not to make the recipe if you don’t think it looks good. These recipes specifically, are made to be quick, easy, and tasty for busy families. I have several spice mixes on my site- Homemade Fajita Mix, Homemade Ranch Seasoning, and Homemade Greek seasoning here. Many processed foods have added salt and so I often do not add extra, however my chicken bake recipes are simple and I mention in the text of almost all of them that if you want to add something or don’t care for something and want to remove it then go for it! These are my personal recipes the way my family likes them, feel free to modify them for your tastes, or just pass if you don’t think it sounds good. Wow, some people are pretty cranky and caustic about recipes they are getting for free. 1. I wonder if this would as a freezer meal? Just assemble it in a disposible pan and freeze? 2. After reading the comments, I’m a little nervous about it being liquidy. But I’m sure whisking it like you said will work fine. Rotel and Velveeta go together all the time for dip. Do you think leaving it uncovered to bake would help get rid of some of that extra liquid? Or will that just dry out the chicken? Hi Nicole- Thanks and I hope you enjoy it! 1. Maybe! I am not sure how velveeta would freeze, but I think the other stuff should do just fine. 2. I cook almost all of my chicken bakes uncovered, but this one I cooked covered just because I didn’t want the velveeta to get dried out so that it would be able to mix well with the juices at the end to make a queso. If you try it though let me know! Okay, have made it twice. 1. It works great freezing it. No changes to texture or velveeta. 2. Definitely better covered like you said. It dried out a lot more uncovered. So glad you enjoyed it! If you haven’t ever tried it, I would recommend my Italian chicken bake, fajita chicken bake, greek and enchilada chicken bakes! They are top favorites here! This was very good. I cut up the chicken into bite size pieces for easier serving and added a can of jalapeno slices. Turned out wonderful! Will make this again for sure. Thank you! Probably, although the texture would be different. i made this tonight for supper, i did drain the liquid from everything including the rotel, i used a whole box of queso velveeta and my family absolutely LOVED it!! I was kinda of shocked cause my sons dont like tomatoes in stuff so i was afraid it was gonna be an “ewwwww mom! !’ moment but nope they all said to make this again soon! oh i did add some salt pepper onion powder and garlic powder to the chicken before i added the beans and things..
Made this tonight and it was so good with a few changes. I used 3 thick chicken breast seasoned with chili powder and cumin, drained black beans, drained rotel, 4 Oz green chiles, frozen bag of sweet potato chunks (from target) instead of corn, and 10 Oz of cubed Blanco Velveeta. Baked covered for 65 minutes. No problem with too much liquid at all. Sweet potatoes added a different BUT, so good flavor. This will be at the top of my list for quick and delicious dinners. Thank you for recipe. Glad you enjoyed it! Hope you get a chance to try some of my other chicken bake recipes! Just a couple of questions. How many people does this serve and what is the serving size, in cups or ounces? It looks like a very healthy dinner and I would be willing to try it. However, I would be serving two children and a bariatric adult. Don’t want to eat leftovers for a week! The 1st Saturday of the month I take kids from the high school and cook lunch at a homeless mission. This is perfect…. easy enough for the kids, relatively quick, and easy to expand to feed lots of people. We are preparing it this Saturday. This is the same as a recipe in a crock pot cookbook that I have. That recipe is one of my family’s favorite dinners. It’s the same ingredients minus the cheese. You let it all cook on low for 8 hours and then shred the chicken up with a fork and eat with taco shells. I think I may try adding velveeta at the end as I would have never thought of that without your recipe- thanks! Can you use frozen chicken breast or does it need to be thawed? It would take forever to cook if they were frozen so I would recommend thawing them. I was thinking about making this today, letting it cool, and then putting it in the fridge until tomorrow. What do you think? Will it be any good reheated? We reheat ours all the time for leftovers. The first time I made this my husband wasn’t home so I threw all the leftovers in the freezer for a week and we ate it when he got home over rice. It wasn’t as pretty as the first time but he did ask me what it was because he thought it was so tasty! Shame all the icons (for pinterest, facebook, etc) on the left hand side of the page cover up the text. It would have been nice to be able to read your post. Hi Ann, I am sorry that happened… it shouldn’t! What browser are you using to view my site? Are you on mobile or desktop? I’m using a Samsung tablet and chrome browser. It also happens on my android phone, also with chrome. Hmmmm…. The site should be mobile responsive with both. I’m going to look into it. Thanks! At the very bottom of all the icons is an arrow pointing to the left. Click on the arrow and the column of icons will move and you can read the post clearly. This was delicious! I’m a vegetarian so I made mine without the chicken, took it to friends who also loved it. Thanks so much for sharing. I was looking for a quick and easy weeknight dinner and this hit the mark! I followed the recipe exactly and it came out amazing — thank you! I will definitely make this again. Did you use regular Velveeta, or did you mean that you used a Queso Velveeta? I don’t know if I’ve seen one like that. Thanks! Do you think that I could dice the chicken into squares before putting it in the pan and it would still cook the same? I made this today. The taste was great, but I also had a runny mess at the end. I drained everything and even browned and seasoned the chicken prior to mixing. Wonder what those who didn’t have a runny mess did differently? I’d like to make it again and have it look more appetizing. I was really looking forward to this! For smell and taste we give it 10 out of 10. We had it with spinach and tomatoes chopped over the top, with tortilla chips. It was watery and curdled looking. I drained the rotel but not for long. I also cut the chicken into about 4 pieces per breast. Otherwise exactly as written. I hope somebody can comment with a solution for the texture. I would probably make this again anyway because it tasted great and the family liked it and it was EASY! Made this last night and loved it. Husband loved it too. This is the second recipe of yours I’ve tried and they both turned out great!! Thanks for keeping them simple and easy! They’re foolproof! I made this tonight. It was absolutely fabulous! I served it with Rice A Roni Spanish rice. I had a lot of liquid, but you said to expect this. I whisked it & voila…queso! I put the rice in a flat Pyrex dish, placed the chicken on top of it & smothered it with the queso. OMG! My family loved it! Thank you, this is a pot luck must! I have a bag of frozen precooked chicken strips… I wonder if those would work? Do you think I would need to thaw them first or since they are cooked just let them heat up as the velveeta melts? Thanks! Cant wait to make this! I made this last night, and everyone in my family LOVED it (which is rare). I made 2 dishes, one dish without rotel because one doesnt like tomatoes, and i knew itd be lumpy without the juice from rotel. When it was done i took the chicken out and stirred i and added a little milk and it was great. Currently finishing my left overs over a bed of rice, and its FABULOUS. This will be added to my menu for sure! This looks so good. I am trying it tonight but realized I do not have foil will that make a difference if i dont cover it with the foil. I can’t wait to try this recipe! I would most likely season and seer the chicken breast first though. I’m sure my family will love it! I will probably season and seer my chicken first though. This recipe was a huge let down. I followed the directions exactly and felt it was super watery which made it tasteless. I love all the ingredients that goes into this recipe but somewhere the wonderful flavors got lost in the watery mess that comes out when finished baking. This tasted good but looked nothing like the published pictures. I drained all of my cans and followed all the directions and it came out VERY liquidly. I ended up having to strain the whole meal to get rid of some of the liquid. We ended up eating it more like a dip with chips. This was wonderful and quick and easy I did mix the cream cheese worth Blanco Velveeta . Yes, it seems a bit watery at first but after it has set for a couple of minutes it’s perfect on rice I actually put it over riced cauliflower to save a few carbs and calories . Thanks for the recipe!! This was sooo good! The only thing I might do next time is dredge the chicken breast in some taco seasoning for just a bit more kick. But perfectly fine without! I will make this again and often! #Yum!! Is this low carb? I’m on a low carb diet but really want to try this! Could I substitute the valveeta for a different brand if cheese, valveeta is so bad for us. I like to feel good about what I put into my body. You could probably use cream cheese or something else that melts creamy not cheesy if that makes sense? I’m fixing this tonite for supper but don’t have or like black beans can I use pinto beans instead? That should work just fine! Hope you love it! I am surprised by all of these negative comments, I follow this recipe exactly the way you write it and I think it comes out fabulous every single time! I love how the cheese gets gooey and mixes well with everything. If people don’t like this recipe then they don’t need to make it plain and simple. This looks delicious! I plan on making it for dinner tonight! Just a quick opinion question though; do you think it would be an awful idea to add rice into the bake? Like, cooked rice, then all the ingredients then bake it the same way you suggested? Or would that ruin it? I am not sure! The rice might get gummy if it was already cooked. If you used minute rice then you might could put it in the bottom uncooked and it would cook in the juices, but then it might not blend as well at the end. Let me know if you give it a try! I ended up not trying the rice because I was scared lol but I did the recipe just how you said, except I did season the chicken with a few different things. This is LITERALLY one of my favorite things that I have ever made! It was easy and delicious! It was a little watery, but I added some shredded cheddar and it made it the perfect consistency. This is a keeper for sure! Thanks for sharing! This dish was just ok. The chicken was pretty bland. Family didnt love it either. Sorry, but probably won’t make again. I don’t know why people are complaining about it being liquidy…it was AMAZING!!! Thank you so much! And the extra liquid just added more flavor to top off the chicken! A possible reason so many are having “watery” results is the chicken. Frequently chicken is “enhanced” with broth or some other solution (up to 15%) and this liquid is released when the chicken cooks. This does look yummy and I will try it soon. This looks soooo amazing and I’m actually gonna be making this more dinner tonight. I can’t wait. I think it’s gonna be great. I will probably put everything on top of rice and maybe go get some tortilla chips tomorrow for the left overs depending on how it come she out tonight. Fingers crossed. I think this one gonna be a keeper though! Thank you for sharing your great recipes! So easy and was so good. I like easy cooking and one dish makes it better. I left the beans out as my husband doesn’t like them . So glad you enjoyed it Leslie! Beans are optional, but I pack in all the healthy stuff I can under that cheese to trick my kids into eating it ha! Oh my gosh! Made this tonight and was delicious!! I did cook my chicken all day in crock pot ( seasoned with taco seasoning,black pepper, cumin, and a little salt). I thought I was going to double the recipe so I added 2 cans of beans, I didn’t up doubling it but only after I dumped the can of beans. My fault, it had too many beans. I did add 2 can of Rotel ( drained). We ate it like a dip with scoops. Do I use Queso velveeta cheese or just the original velveeta?? Planning on making this for supper tonight. I love your recipes. Some women are so catty. Wow. I am a Cajun to the bone, so I always modify recipes to taste. Thank you for sharing! As we say in the south, bless their cotton picking little hearts😛. I made this last night! It was delicious! I did drain the Rotel as others suggested. Thank you for sharing this recipe! I will definitely make this again! Okay…I’m back to report my findings (see my first post). I checked on it after 25 minutes and mine was slightly watery, but no worries. After stirring it was better, but then I remembered one of the other comments I saw earlier about adding cream cheese and I just happened to have some in my refrigerator. I only had about 2 oz of it but I figured it wouldn’t hurt so I added it and started in well and popped it back in the oven without aluminum foil. It turned out awesome! I will be serving it over rice that I also added some to route to which gives it a nice yellow hue. This is definitely a keeper! The flavor is amazing! Hi I’m planning on making this tomorrow but was wondering what your thoughts would be on throwing everything in the crockpot on low earlier in the day? I’d like the chicken to shred so that we can use it as tacos? But not sure about the cheese cooking on low for too long. My guess is that it would probably work. People have queso dip on for hours at parties and it says good so I think it would be fine especially if you are not removing the lid. Let me know how it goes if you try it! After trying many chicken quest bakes and always being disappointed, I’m glad I stumbled upon this one. This was delicious and a huge hit with the entire family. I drained the tomatoes and seasoned the chicken with my homemade taco seasoning. I served it over quinoa, I will definitely be making it again. Thank you! Glad you really enjoyed it! I certainly have a soft spot in my heart for anything cheesy and this doesn’t disappoint! Made this just as is and it was pretty amazing!! I was very worried when it came out with a soupy texture, but I stirred it up and just topped the chicken with it and it was great! Definitely a keeper, thank you! So glad it was a hit! I hope you get to enjoy it many times to come. So yummy! My family loved this and we’re adding it to our dinner rotation! I served it with tortilla chips to get all the little bits. The leftovers were just as good. I think it would make a yummy dip too, with chopped up chicken. Going to try it soon! This is probably a stupid question, but has anyone tried this with another type of meat other than chicken?? My family loved this. becuase im lazy i used Perdue chicken shortcuts. I think southwest flavor? it was easy and came out so good. thanks for sharing. These are great comments for a great recipie I plan to make soon. Thrilled to see someone else had asked about the freezing meal aspect too-yay for Community! I love this recipe. For those that say too much liquid, I use a turkey baster to take out the excess liquid. It is a little extra work, but it is well worth it in the end. Even with that extra step this is still a very easy and convenient meal to make. I avoided mixing the cheese with the liquid for fear it would not mix well together, and had that confirmed in others comments. This is one of my family’s favorite recipes, all it needs is some of the excess liquid drained out. This is the first time I’ve ever commented on a blog post, but I just felt I needed to add my experience after all the mixed comments on this recipe. I know this is classified as a quick & easy meal, but I needed it to be ready even faster by the time we get home from work & pickup from daycare. I used the Crockpot! I used 3 decent sized chicken breasts on the bottom, light layer of taco seasoning on them, drained the 3 cans of ingredients called for in this recipe, and used 16 oz of velveeta cut into chunks layered on the top. Crockpot on LOW for about 5 hours. Removed the chicken, whisked together cheese sauce, shredded chicken then added it back into the sauce. (Word of advice with the velveeta-I had to pick out the pieces that had been touching the side of the crockpot, they had burnt & were hard) OH MY GOODNESS! My very picky 2 year old son stood at the counter with me & devoured his serving as we were shredding and stirring. Yes, he even ate the corn/beans/tomatoes with it! Served over brown rice in a tortilla for the husband & I. Tried this today and found it delishes . Makes alot of queso I found might need to get some chips for this next time . Also is this considered a low carb meal ? This is very good. I added sweet onion and cooked it in my copper pot on my Induction plate. I will definitely make it again. This looks too easy to be so delicious! Have you tried it with a different type of cheese besides Velvetta? This was awesome! I am not a fan of dishes like this normally. But we wanted some new ideas so I gave it a try. Everyone liked it. My oven was broken, so I grilled the chicken and then tossed it all together in a frying pan on the stove. Also, used shredded cheese instead of Velveeta. Quite tasty and easy. I’d definitely make again. What is the Calorie count per serving for this? This was a great recipe! My velvet a had expired by the time I got around to making this so I improvised with cream cheese and a mix of other shredded cheeses. It was not pretty but was delicious !